Kabuki Klash: Far East of Eden (天外魔境真伝, Kabuki Klash: Far East of Eden?) 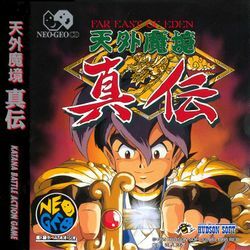 is a 2D fighting game spin-off or gaiden in the Far East of Eden series of Japanese RPGs, developed by Hudson Soft and published by SNK Playmore. It was originally released for arcades in the summer of 1995, and was shortly out for the Neo Geo in the same year, followed by a Neo Geo CD version. This page was last edited on 6 October 2009, at 23:26.